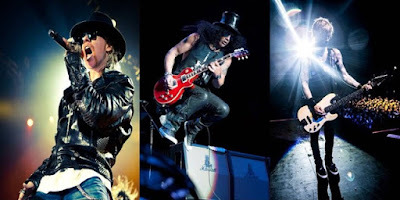 Guns N’ Roses live-streamed a performance of their new single, “Shadow Of Your Love”, during a June 12 show in Gelsenkirchen, Germany. "Shadow Of Your Love” also has the distinction of being Guns N’ Roses’ first radio single featuring its original lineup of Rose, Slash, Izzy Stradlin, Duff McKagan and Steven Adler since "Patience", which peaked at No. 7 in March 1989. “Appetite For Destruction: Locked N' Loaded” arrives during Guns N’ Roses summer tour of Europe, which opened in Berlin, Germany on June 3.